Rank 1 have been on form recently, especially with their 13 minute numeric track ’13-11-11’ and then ‘Freudenrausch’. Now the Dutch duo have done what some had given up hope that they’d ever do, delivering a new century, root-&-branch reworking of the track many see as their most recognisable hour… ‘Airwave’. A decade and a half since it first assailed clubs speakers, the tune that became near synonymous with the halcyon days of ID&T’s Trance Energy events returns. Debuting in 40 different international territories in its first year alone, it is perhaps the most under-remixed classic trancer of all time. If ‘Airwave’ is coming to you as one of your fondest club memories, this remix takes the heart and essence of the original version and warps it 15 years forward for a next-gen rework. A release most cherished by Rank 1, the pairing of Piet Bervoets and Benno de Goeij have long held out on giving the nod to new third party remixes, acknowledging the profusion of bootlegs, and holding off from reworking the track themselves. 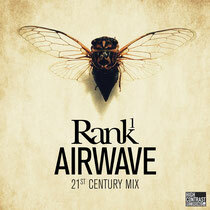 Now, for the 15th anniversary the pair have finally given ‘Airwave’ its 21st Century rephrase. Kicking off with its hallmark, deeply resonant LFO, modulating sub-riffs and acute and echoing timbale percussion, it begins the slow release soar of its mile-wide chords and pads. Taking the mainline from one century to the next, Rank 1 underpin the original lead with a strident toughened sub-sound, sending the riff up for days and finally bringing about a big club-floor effect.